Both manufacturers almost exclusively collect all profits made in the smartphone market with larger profit margins than the rest of the competition. The smartphone market consists of only two big winners: Samsung and Apple. Though both control "only" 35 percent of the smartphone market share total, the latest statistics from investment firm Canaccord Genuity show that the two manufacturers reap nearly 100 percent of the profits. 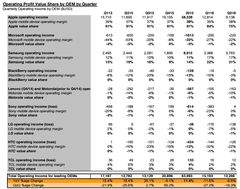 Apple's value share is at 75 percent as of Q2 2016 compared to 91 percent in Q2 2015. 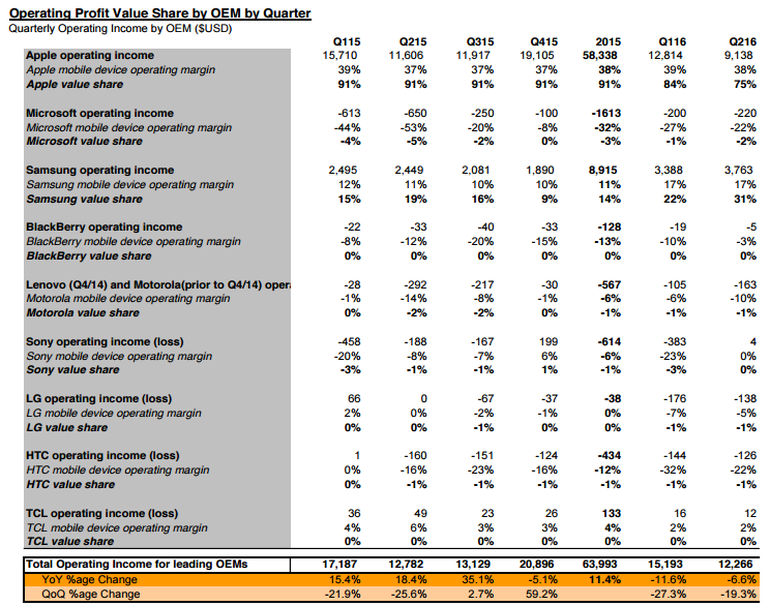 On the other hand, Samsung's value share is at 31 percent as of Q2 2016 up from 19 percent in Q2 2015. Several factors are responsible for the high value shares including Samsung's increasingly high profit margins from 11 percent to 17 percent and the very good sales performance of the Galaxy S7 series. Meanwhile, Apple continues to face falling demand for its iPhone series that has yet to be refreshed for 2016. Other smartphone manufacturers reap almost no profits from the smartphone business compared to Apple and Samsung. A few manufacturers like Microsoft and BlackBerry are experiencing lower losses this year compared to the same period last year, but this is because both manufacturers have been selling far fewer phones for much smaller losses. LG is expected to report significantly higher losses this year due to the poor sales performance of the LG G5 while both Lenovo and HTC should be reporting more losses later this year as well. The ZDNet source has come to the conclusion that smartphone manufacturers other than Samsung and Apple are forever locked in a vicious cycle. Manufacturers like Xiaomi, Oppo, Huawei, Vivo, and countless others will have to accept being far behind in third place or lower and it remains to be seen if a single manufacturer can comfortably hold onto third place the same way Apple and Samsung have locked in the top 2.